Eirigi press officer Stephen Murney has given an account of the physical and mental torture he endured while interned at Maghaberry prison, outside Lisburn over the past 14 months. The following extracts are taken from an interview with Newry journalist Paula Mackin and published by the Sunday World last week. Eirigi press officer Stephen Murney has revealed how he was made to endure humiliating ‘crucifix-styled’ strip searches and other abuses during his 14 months held awaiting trial. The 30-year-old said the experience proved to be a mental as well as physical torture following repeated forced strip searches, sometimes twice a day. His health suffered and he lost a significant amount of weight. “I was forcibly strip searched about 20 to 30 times when I was in there (Maghaberry),” he said. “Just before the searches were about to happen, I was taken into a room and asked if I was going to comply with a search, I would make it known I wouldn’t. He said this was to “get you worried” before the cell door then opens and six warders known as ‘the Riot Squad’ enter the room in black boiler suits with utility belts and batons. “You are standing in the cell, they stand around you,” he said. “One in front, grabbed me by the face, each one to the side grabbed me by the arms, and hold you out like a crucifix position. “The others behind me force me on my knees then pushed my face literally into the ground. At that point you are fully clothed, then they start removing your clothing. I didn’t put up resistance. “They held me in arm locks and pressure points and then left me lying on the ground, degraded and feeling humiliated. “And they never tell you what they are looking for,” explained Mr Murney. He said the searches were unnecessary as the prison is equipped with an electronic chair that can detect any concealed object. The Eirigi spokesman was finally acquitted last month after the last charges of taking and publishing photographs of PSNI members were rejected by the non-jury court. Other charges including possession of BB guns and combat-styled clothing had been thrown out by the Diplock judge in January. Defending lawyer Darragh Mackin has now confirmed that he will be pursuing a civil action for damages for his client. Mr Murney was arrested in November 2012. The whole experience had been hard on his family, especially his six-year-old son, he said. “He knew where I was and why, he knew the police had been harassing me for months before the raid. He was there in the house when the armed police raided my home at six in the morning,” he recalled. Occasional visits from his son and the support of his family helped keep him going. “As you can imagine I always looked forward to his visits. It was really difficult to say no to bail, but I had the support of my family. He said he would continue in his work with in establishing a new electoral campaign north and south of the border. 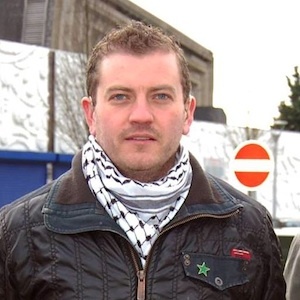 “We were being heard before I was arrested and we are continuing to be heard and that is what the British state tried to put a stop to by locking me a way,” said Mr Murney. The socialist republican does says that a united Ireland is possible in his lifetime, but has says Sinn Fein’s Martin McGuinness is living in “Cloud Cuckoo Land”. “Martin McGuinness’ vision of a united Ireland by 2016 is just two years away, and in my opinion it is just not going to happen. “I would like to see it happen in my lifetime. Ireland has a wealth of natural reserves that is yet to be tapped into, and just like Scotland voting on independence, it can happen here too. “We have already chosen candidates for the upcoming local council elections with two in Belfast and seven in the South. And we will be considering potentially sitting in the new super council of Newry, Mourne and Down. “Don’t forget I am an innocent man, and I intend to pursue my political beliefs despite all that has happened to me,” said Mr Murney.